Authentic Chinese food or non authentic? Unless you’ve eaten your way throughout the Chinese provinces, how do you really know the difference? 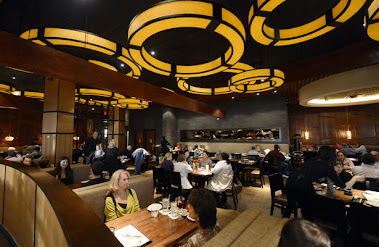 Many dispute whether Chinese food giant, P.F.Chang’s, offers patrons an authentic Asian culinary experience. This American restaurant chain consisting of over 200 locations has now made its way to Canada with its inaugural location at the Shops of Don Mills in Toronto. Since its grand opening this past summer the establishment is receiving mixed reviews in respects not only to authenticity but also service. 'A Chinese restaurant for our wedding anniversary?! Are you kidding?!' I gasped at Tony after his absurd suggestion that we try the new P.F. Chang’s. Although I do enjoy Chinese from time to time, I thought we should do something fancy-schmancy for an important event as our anniversary. 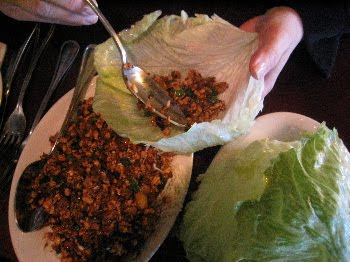 I had also dined in some seedy establishments along Spadina Avenue where dim lanterns cast shadows on grimy walls, where my elbows rested on sticky tables and albeit the yummy food, I suffered the week-long consequence of diarrhea. Was I ready for P.F. Chang’s? 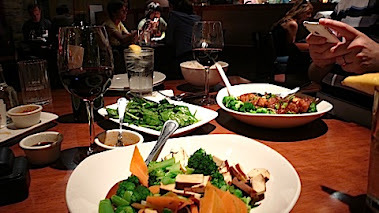 As soon as we arrived I was surprised by the restaurant’s modern elegance along with its cozy, warm ambience. Although we had a reservation we had to wait a while for our table. The savoury aromas permeating the air elevated my anticipation. Luckily a short time later I found myself sipping Prosecco, while feasting on Steamed Chicken Dumplings, Dynamite Shrimp and the restaurant’s giant signature Chang’s Vegetarian Lettuce Wraps. I have to say that I found everything to be quite agreeable. All the dishes, including the Almond and Cashew Chicken as well as the Mongolian Beef were cooked to perfection and had an abundance of flavour. I was going to try a signature dessert, The Great Wall of Chocolate, but opted out remembering the bikini I would be soon be wearing. I can’t give an informed rating on the service as our waiter could have been a little biased in our regards. A super friendly guy, he may have given us special treatment as he turned out to be a huge fan of my husband’s radio show. As for being authentic Chinese, is that even possible for an American restaurant chain since it must appeal to the average North American palate? Nor does P.F. 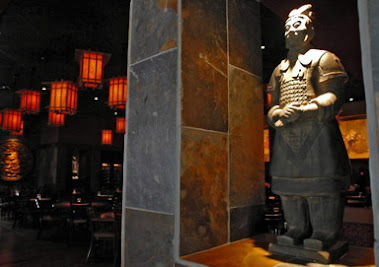 Chang’s pretend to be anything but Chinese-American. As per the company website, it refers to itself as “…a unique environment offering influences of Chinese and American cultures”. The cost of our meal came to roughly $120, tax and tip included, which I thought was pretty fair. I found the pricing proportional to the quality of the ingredients and the size of portions. 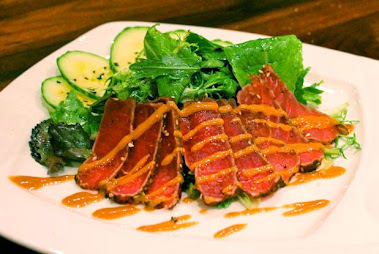 The restaurant was clean, the menu had an array of options and the staff was friendly. Would I go back again? I already have…for my birthday!